Warren Presley 'Shorty' Aldridge, Jr.
Warren Presley "Shorty" Aldridge Jr.
Warren Presley "Shorty" Aldridge, Jr., 86, of San Angelo was welcomed home on Monday, February 25. He passed after a short illness at Shannon Medical Center in San Angelo. Funeral services will be held at 10:00 AM Thursday, February 28th in Johnson's Funeral Home chapel. Interment will follow at 3:00 PM in Santa Anna Cemetery. Visitation will be held from 6:00-8:00 PM Wednesday, February 27th at Johnson's Funeral Home. Warren was born May 2, 1926 in Lawn, TX. to Warren Presley Aldridge, Sr. and Mary Beulah (Vanderford) Aldridge. 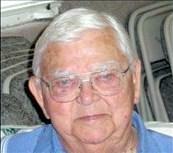 He was married to Marion Elizabeth Guess on August 3, 1945 in Wingate, TX. He took great pride in the fact he was a WWII US Army veteran, having received the Purple Heart and 3 Bronze Stars while serving in Germany and Belgium. The Aldridges found their way to the oilfields of west Texas where he went to work for El Paso Natural Gas in Kermit, Texas and later Jal, New Mexico. They raised a family of five sons while residing in Jal. Warren stayed in Jal until all the boys had graduated high school. After a short stint in Williams, Arizona, the couple returned to the Permian Basin where he eventually reached the level of plant superintendent at Keystone Field, before retiring in 1985. In all "Shorty" Aldridge worked over 30 years with the natural gas company. Warren and Marion raised their sons in the same manner they lived, with respect for hard work, honesty in life, and integrity at all times. The couple retired to a portion of the family farm in Santa Anna, Texas where they found great pleasure in gardening and entertaining the many grandkids with holiday bonfires, fishing and tractor rides with Papa. Warren became an ordained deacon of the First Baptist Church in Santa Anna. The couple served the Lord and their community faithfully for eighteen years before moving to Baptist Memorial Retirement Center in San Angelo. He and his wife of more than sixty seven years continued their service to the church becoming members of the Edmund Boulevard Baptist Church. Warren will forever be remembered for his giving heart, firm convictions and caring nature. During the time in San Angelo the couple was watched over by many, but in particular one loving, loyal and special niece, Becky Bell Cash. The family is and will forever be grateful for Becky and her dad Jimmy Bell for the loving care and special attention they willingly gave and continue to give. Becky is considered more of a sister than a cousin. The family would also like to thank the staff at Baptist Memorial Division 2 for their personal and professional attention. He was preceded in death by his parents, one son Ray Aldridge; two brothers W.R. "Jinks" Aldridge and wife Freddie, Van Aldridge, and sister-in-law Ruth Aldridge. Survivors include his wife Marion Elizabeth (Guess) Aldridge of San Angelo; four sons, Don Aldridge and wife Vicki of Lewisville, Martin Aldridge and wife Janice of Midland, Andy Aldridge and wife Marcia of Las Vegas, NV, Stephen Aldridge and wife Karla of Jal, NM, and daughter-in-law Leta Aldridge of Robert Lee; one brother W.D. "Dub" Aldridge of Santa Anna; sister-in-law Sue Aldridge of Grapevine, 14 grandchildren; 17 great grandchildren and numerous nieces, nephew and cousins. Pallbearers will be Dustin Aldridge, Stacy Aldridge, Brandon Aldridge, Caleb Aldridge, Seth Aldridge, Jody Franks, Drew Aldridge, Mark Bell, and Randy Long. Honorary pallbearers include the grandchildren, great-grandchildren, and the deacons of both the Santa Anna and San Angelo churches. The family request memorials be made to Edmund Baptist Church, San Angelo, First Baptist Church, Santa Anna or a favorite charity.